With the cold months of winter beginning, it’s time for oden. Oden is a one-pot dish full of vegetables, fish cakes, tofu, eggs and konnyaku, all simmered in seasoned dashi broth. It’s pure comfort food, full of savory ingredients that have soaked up hot seasoned broth, perfect for the cold months of winter. Oden is enjoyed by everyone in Japan, from children on their way home from school to homeward bound working professionals stopping at street vendors for oden and sake. When made at home, oden includes special ingredients loved by each family member. 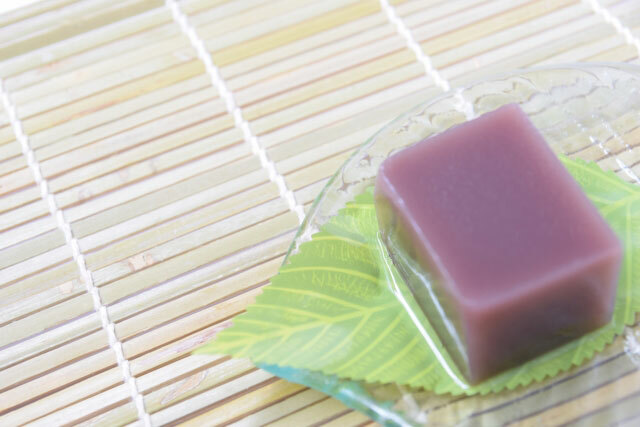 One of the characteristic ingredient is konnyaku, a jellied yam cake. 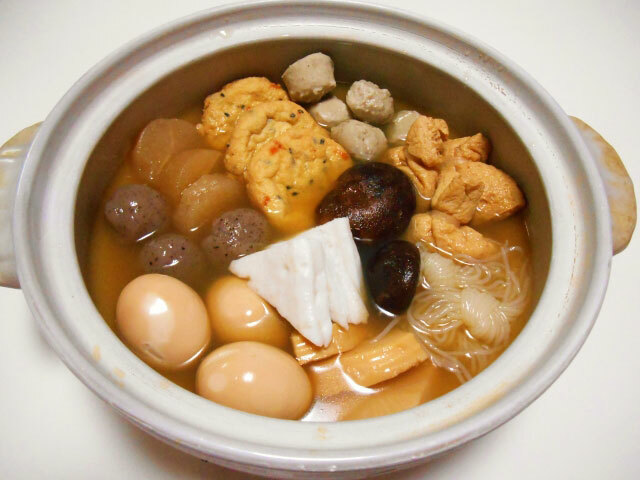 Those who enjoy oden choose the ingredients to add to their bowl, sometimes adding chikuwa (fish cake), ground fish balls, kinchaku (fried tofu pouches), daikon radish, boiled eggs or vegetables like cabbage and potatoes. Oden is best when garnished with hot Japanese mustard. Oden is a cross between a nimono, or simmered dish, and nabemono, or hot pot. The name oden is derived from dengaku, which refers to pieces of tofu and konnyaku skewered, basted with miso paste and grilled. Dengaku was typically served during colder months, and around the time of the Muromachi Period (1336 – 1573), the dish was modified to be simmered in seasoned broth. Oden is prepared with variations depending on the region in Japan. In Tokyo and its environs, the broth is made from dashi and koikuchi shoyu, or dark soy sauce, and is typically salty in flavor. In the Osaka area, broth is made from dashi and usukuchi shoyu, or light soy sauce, with hints of sweetness. 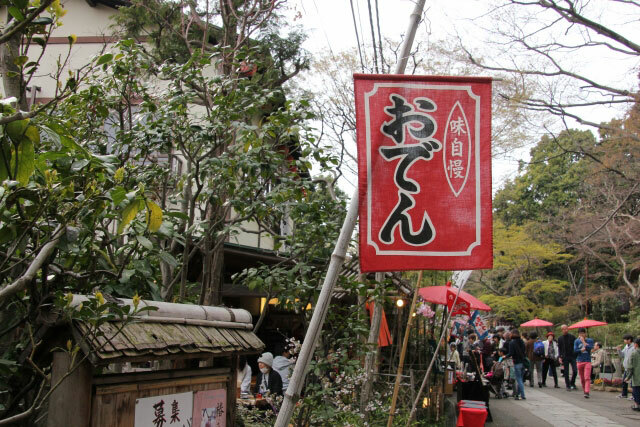 Oden from the Kyoto area has a sharp and sweet taste and in Nagoya, the broth is miso-based. No matter what style of broth oden is made with, the warmth and savoriness of the ingredients characterize comfort during the coming winter. Oden can be found at street vendors, izakaya restaurants, and even at convenience stores where the clerks will either assemble your oden for you or let you make your own creation at the self-service counters. One of our favorite oden recipes can be found here, and we hope you will try it out during this winter season. Until next time, stay warm and don’t forget to look out for our last post about Japanese street food for 2016! Throughout the year, we’ve focused on the essentials of Japanese cooking, from basic pantry items to the principles of washoku, Japan’s culinary tradition. From the basic ingredients of sa shi su se so (sugar, salt, vinegar, soy sauce and miso) to the more complex creation of dashi and umami tastes, we’ve explored how to prepare appetizers, soups, pickles and main dishes. 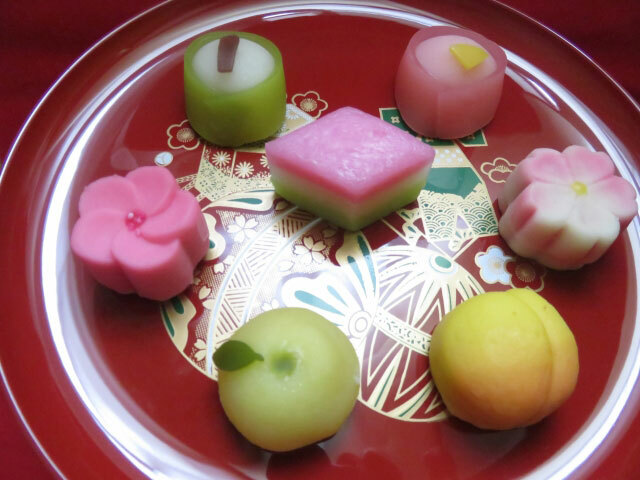 This month, our post focuses on wagashi, or traditional Japanese sweets. Wagashi, which literally means “Japanese sweet snack”, are bite-sized confections. They are traditionally made with simple, plant-based ingredients. The simplicity of the ingredients, however, is deceptive, as wagashi are created based on washoku principles of the Five Tastes and the Five Senses and take into account the seasonality of the natural world. Wagashi is said to have originated in Japan during the time Japanese emissaries returned to the country from visiting China in the 8th century. The first truly Japanese form of wagashi was a mochi and azuki bean dumpling sweetened with the juice of various vines. As this delicacy became more popular and spread to cities influenced by the aristocracy along the west coast of Japan, such as Matsue and Kanazawa, wagashi creation and design flourished. In the 12th century, wagashi became part of formal tea ceremonies and was paired with bitter matcha tea. When sugar was introduced to Japan in the 16th century, wagashi became easier and less expensive to produce, making it available to the general population. The variety of wagashi is vast, and it is classified using a few criteria: formal vs. every day, production method, moisture content and shape. Formal wagashi are served at tea ceremonies or special events and are sculpted to represent a seasonal motif for the particular event, such as cherry blossoms in the spring to celebrate Girl’s Day. Every day wagashi are found at street vendors and shops and come in the form of dumplings or cakes or specialized shapes, with various fillings and toppings, usually made in the morning to be eaten that day. Some of the formal wagashi are crafted based on the seasons. Their base flavors include the five tastes–sweet, salty, sour, bitter and spicy–with a particular taste emphasized according to what is seasonally available. For example, in the spring, when people gravitate towards sour flavors, wagashi are flavored with oranges. Each piece is also crafted to appeal to the five senses, from the seasonal motifs of each shape, to the fragrance of the ingredients, to the taste, to the texture to the sounds of nature that are evoked when eating a piece. Making wagashi is considered a craft, and wagashi makers can be awarded the title of “Contemporary Master Craftsman”. 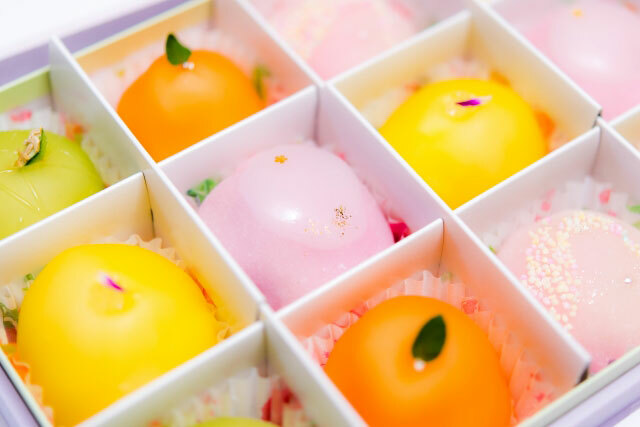 Wagashi craftsmen take pride in creating confections that balance seasonal flavors and motifs, from traditional cherry blossoms to modern Santa Clauses, appealing to the tastes of all generations. Going to a wagashi shop will make you anticipate the season or special event or festival to come! Modern wagashi are made with eggs, milk and chocolate, and also come in beautiful shapes and colors. One type of wagashi commonly found in the United States is called daifuku, which can be made at home. Pair it with Matcha Tea and you have your own homemade snack break! We’d love to hear about your wagashi experiences, so be sure to leave us a photo and a note in the comments below! We’re excited to introduce our new Gourmet Sizzler® Electric Griddle (EA-BDC10)! This new Gourmet Sizzler® model comes with user-centric features, including an easy-to-handle size, a convenient lid that allows speedy cooking, a long power cord, and an optional takoyaki plate accessory (EA-YBC01, sold separately). The removable cooking plate features a titanium and ceramic enhanced triple-layer nonstick coating which is protected by a diamond pattern cooking surface. This innovative combination helps to keep foods from sticking. This new griddle also has a temperature control plug that lets you choose between a keep warm temperature of 176°F to a high-heat temperature of 400°F. This variable temperature makes it convenient to cook a range of foods, from breakfast dishes like eggs, bacon, sausage and pancakes to filling dinners like okonomiyaki, noodles and meat. 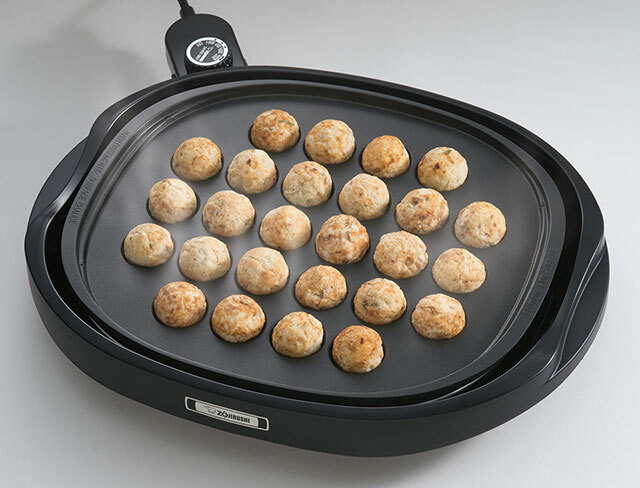 The optional takoyaki plate accessory (EA-YBC01), which can be purchased separately, makes this griddle even more multipurpose, letting you make 26 large, savory takoyaki at a time… you can even cook sweet mini-cakes! If you’d like to learn how to make takoyaki, check out our video on YouTube! 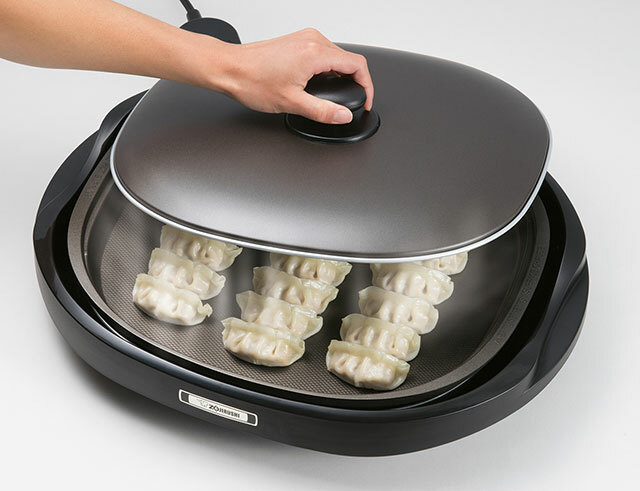 The convenient lid makes preparing gyoza (dumplings), vegetables and tender stir-fries easier, since all parts of the cooking process happen on the griddle–steaming, sautéing and pan-cooking. The lid also prevents oil splatters or spills. This griddle is great for at-the-table cooking and dining with friends and family, thanks to the 6.6 foot long power cord. We know cooking should be safe as well as creative and the Gourmet Sizzler® Electric Griddle comes with numerous safety features. The cooking plate and heater sit inside the body guard to protect against scalding. The plate won’t heat unless correctly installed, and the unit won’t turn on if the temperature control plug and power cord aren’t properly clicked into place. Assembling and disassembling are easy and keeping the griddle clean is a breeze. The cooking plate and body guard can be fully immersed in water for cleaning, with the nonstick surface of the plate requiring only gentle scrubbing. The heat shield plate simply needs to be wiped down before storage. 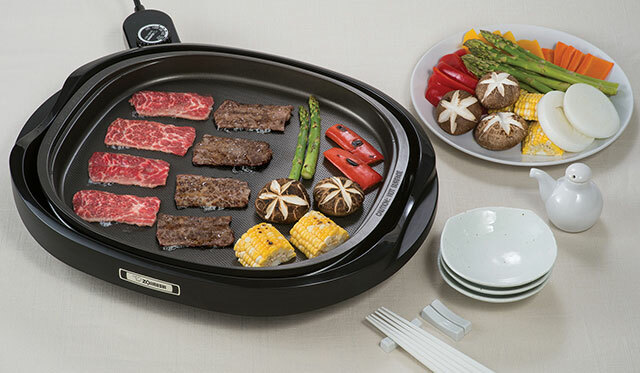 The Zojirushi Gourmet Sizzler® Electric Griddle brings your recipes to life and is the perfect addition to any kitchen. Share your recipes with us below! And don’t forget pictures! Have you made perfectly delicious rice yet? Now that you know all about rice, we want to share our favorite recipes for this versatile and nutritious grain… not just from Japan, but also from across the globe! Rice is an ancient food, and many cultures have created sophisticated, comforting dishes using local ingredients to satisfy regional tastes. 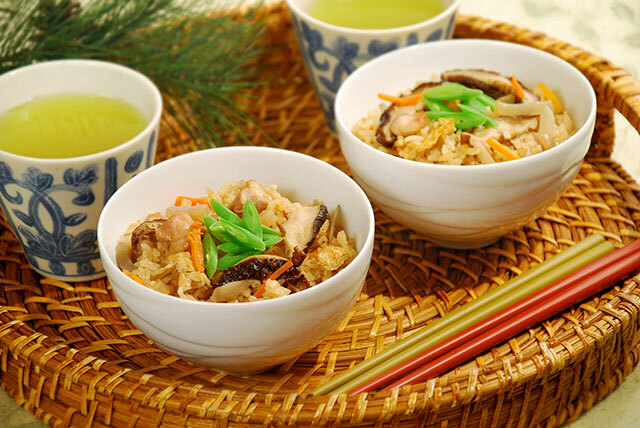 We start with rice dishes from Asia, including Japan, China, India and Pakistan. Takikomi-Gohan (seen above) is a popular rice dish that emphasizes the classic Japanese culinary tradition of using seasonal ingredients. At Zojirushi, we’ve created a recipe full of flavorful vegetables, konnyaku, tofu, chicken and dashi. This preparation can easily be made in one of our rice cookers, and makes great leftovers—make a large batch and refrigerate for no-brainer lunches throughout the week. 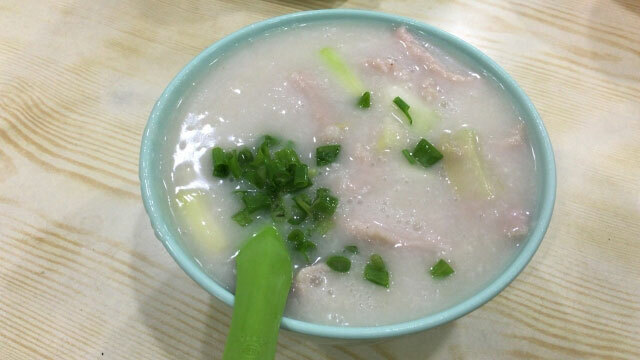 China is famous for comforting rice dishes, too, including the classic rice porridge, also known as congee or okayu. Rice porridge is mild and filling, and is often had for breakfast or during an illness, as it is easily digested and soothing to the stomach. Japanese, Indian, Burmese, Korean and Indonesian cultures made a version of it, and we love this classic rice porridge recipe that you can make in our food jars. India and Pakistan share a classic rice dish called biryani. Biryani is made by layering ingredients such as chicken, lamb and vegetables with long-grain basmati rice, and seasoning it with milk and a complex combination of spices like saffron, chili, cardamom, turmeric, ginger and garlic. The dish is slow, slow, slow cooked, until all of the ingredients are tender and have soaked up the seasonings. It’s not to be missed! Europeans, both from the western and eastern parts of the continent, savor rice as well. The classic risotto is popular in Italy and around the world. The most basic risotto is made with medium-grain Arborio rice, slowly cooked in wine and broth until it becomes creamy. 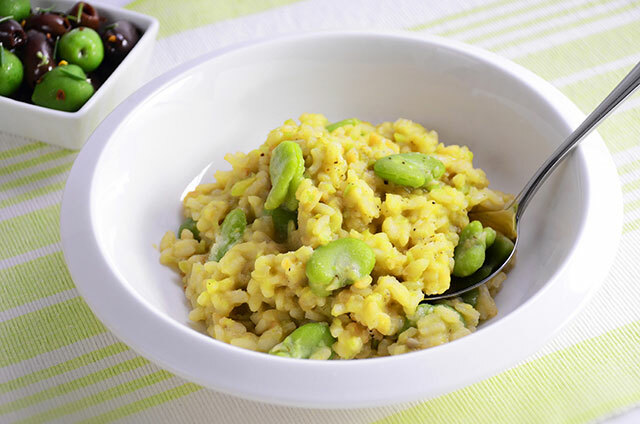 Popular variations add mushrooms and peas, and we love this recipe for Fava Bean Risotto. Italy’s neighbor Spain is famous for its paella, and we love this classic version with shrimp, mussels and clams. Eastern European rice dishes are heavily influenced by the spices of Asia and the Middle East, and Uzbek plov is a prime example of the blending of these cultures. Plov is made using long-grain rice, mutton, carrots, onions, oil and water, mixed and cooked in an open cauldron for hours until the aroma of the dish is utterly mouth-watering. Plov is often served with chickpeas, raisins and eggs, depending on the time of day it is eaten. Plov also has an interesting history, and it is said to have been made for Alexander the Great and his army. The Americas have their own special rice dishes which are consumed with as much gusto as their friends on other continents. 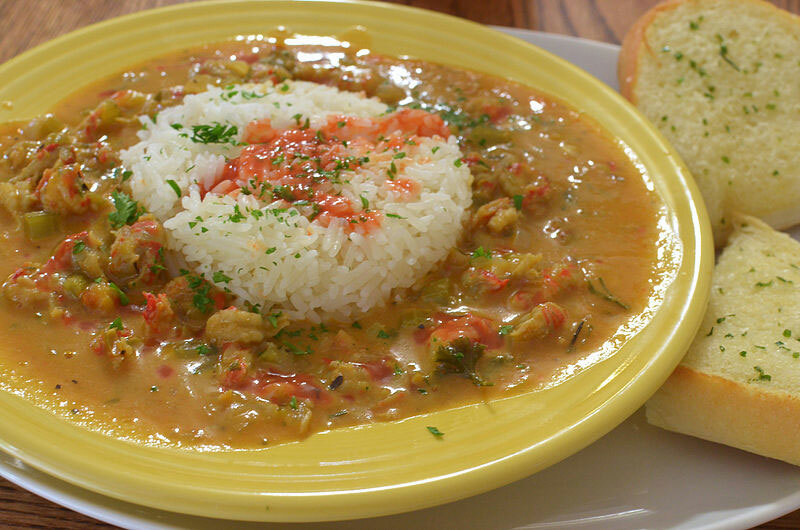 Crawfish etoufee is an elaborate and spicy dish consisting of shellfish and spices “smothering” the rice and braised in a large sauté pan. Arroz de lisa is a distinctive Colombian dish prepared with mullet rice, cooked cassava melon, costeño cheese and a piquant sour cream sauce. The rice is served in a bijao leaf and often eaten as street food. Rice as a whole grain isn’t the only way it’s eaten across the world. Rice in the form of noodles is incredibly popular, and some of our favorites are Singapore Noodles, redolent with curry, onions and bell peppers, along with spicy, coconut-infused laksa from Malaysia, pho from Vietnam and the ever-popular wok’d chow fun with Chinese broccoli. Rice, rice noodles, rice paper, rice dumplings… the variety is endless! We hope you try some of these recipes… and as always, share your creations with us in the comments below. I have a sweet tooth. Aside from my weakness for donuts, my next fav is probably Hawaiian sweets. There are certain local cakes, pies and puddings that are best eaten when you’re in the Islands, and I always make time to get some whenever I visit. BUT you can also get them on the mainland, if you look hard enough. And like everything Hawaiian, diverse cultural influences have combined to make the most exotic dishes in the world. A wonderful name for a wonderful cake, and so appropriate. A tri-colored and tri-flavored spongy chiffon cake, this is the one that most kids go for in Hawaii. 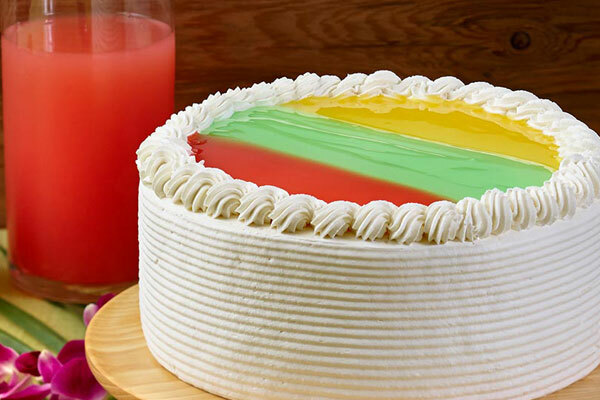 Each slice is a 3-layered masterpiece, flavored in pink guava, yellow passion fruit and green lime. The guava pretty much takes over the taste, but the colors are so happy, who’s going to complain? The shot above is from my favorite bakery called King’s Hawaiian, so I’m going to give them a shout out. I used to go to this bakery when I was a kid living near King Street where they were located. Sadly, there is no King’s Hawaiian bakery in Hawaii anymore. 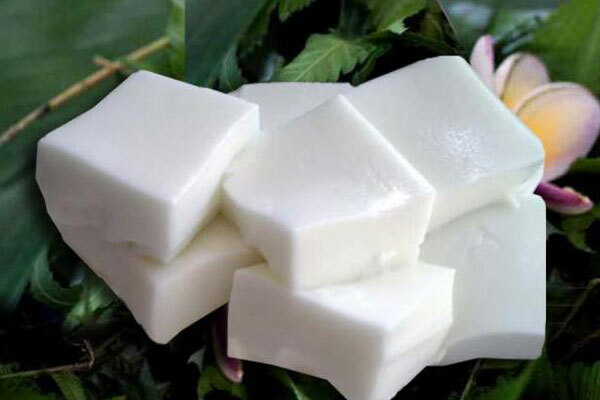 No, this isn’t tofu, this is haupia, a traditional pudding made from the arrow root and flavored with coconut milk and sugarcane juice. You’ll often see it made into fillings for pies and layered into cakes. It’s a local luau favorite, but it’s been catching on with the health conscious too, as a vegan alternative, for gluten free diets and for the lactose intolerant. I love puddings, and the lightness of the flavor of haupia seems to really match the texture–somewhere in between creamy and gelatinous, you know what I mean? Everyone should know by now that I’ve admitted to donuts being my Achilles’ heel. 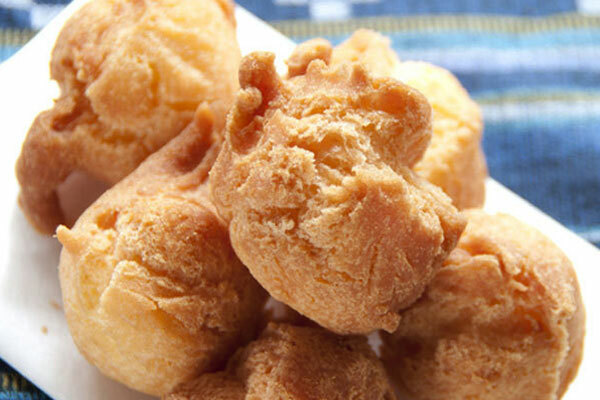 One kind of donut that I really like is an Okinawan type called Andagi. It’s more like a donut hole actually, but bigger and not full of air. These guys are anywhere between the size of golf balls to billiard balls when they come out of the deep fryer, and they’re a very solid cake donut—crispy on the outside and fluffy on the inside. And contrary to what you might expect, they’re not glazed or sugar coated; they’re just eaten plain. So good! And have them warm for best results! Now that we’re talking donuts, let’s stay on the subject! The malasada has Portuguese origins, brought to Hawaii by plantation laborers in the 1800s. Being predominately Catholic, the Portuguese immigrants would give up sweets for Lent by using up all their lard and sugar to make large batches of malasadas to share with friends in the plantation camps. 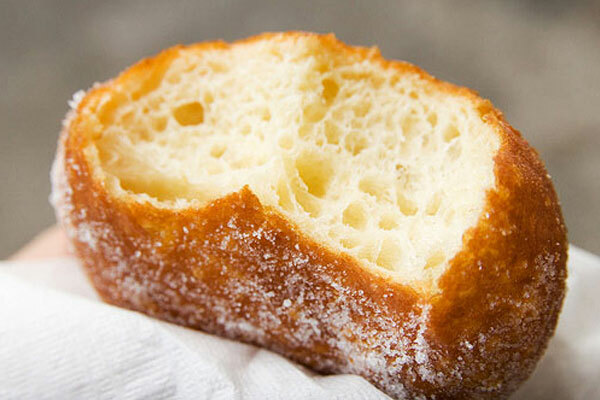 Lucky us, this led to the widespread popularity of this deep fried, sugar coated donut in Hawaii. Malasadas come with all kinds of fillings today–custard cream, chocolate, haupia–but for me, the plain ones hot from the fryer are the best! If you ever want to try a real Hawaiian dessert, you should go for kulolo. This sweet pudding is more like Japanese mochi in texture, so it’s a firm kind of pudding. You can usually find it cut up into fudge like squares and sold in brick shapes. The main ingredient is the taro root, or kalo in Hawaiian, which is the traditional main staple of old Hawaii. 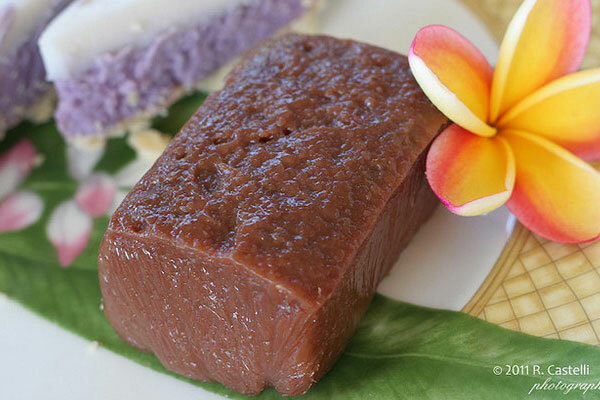 In the old days kulolo was made with taro, fresh coconut milk and raw sugar–it was then wrapped in leaves and baked for 8 hours under the earth. Much harder to do these days, but you can still get taro. Over 80% of the state’s production comes from the island of Kauai, where Islanders say the kulolo is the best. Butter! In the name of the dish! ‘Nuff said. Seriously, if I told you the main ingredients were butter and coconut, wouldn’t that be enough to get you interested? 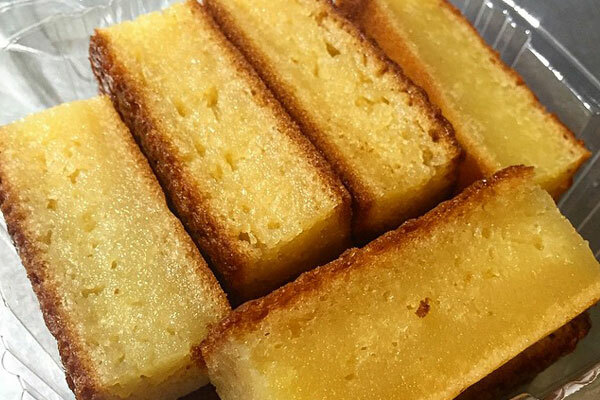 Essentially a baked custard, butter mochi is made with a rice flour (mochiko) base, which gives it a soft, chewy, sticky consistency similar to mochi. There’s always one auntie who makes “da bess” butter mochi at every potluck family gathering. 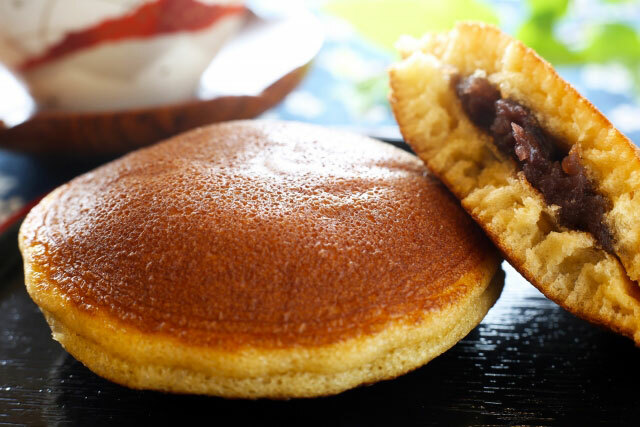 If you want to try making one yourself, Zojirushi has a recipe of theirs right here. There are so many more Hawaiian style baked goods I could get into, but these are the ones I consider the classics–and I really like how they reflect the cultural diversity of the Islands. The ingredients are local, and each dish comes from the heart of the people of Hawaii.